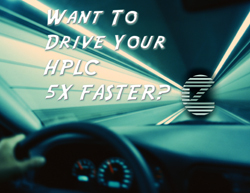 Chromatographers have long known that an increase in operating temperature can dramatically improve both the efficiency and speed of an HPLC separation. There are three main effects that happen at elevated temperature. Firstly, the viscosity of the mobile phase is decreased, so that higher flow rates are possible with existing equipment without increasing backpressure. Secondly, at higher temperature, the diffusion of analytes into and back out of the pores of a chromatographic material is faster, so the efficiency of the separation generally improves. Finally, at elevated temperature, the kinetics of the interactions between the analytes and the stationary phase are faster. This will lower the overall retention, but also often reduces or eliminates tailed peaks. ZirChrom now offers short (2 cm) all-stainless steel pre-columns for ultra-fast high temperature reversed-phase liquid chromatography. These columns are only sold in sets of two. Mix and match ZirChrom chemistries if you like! 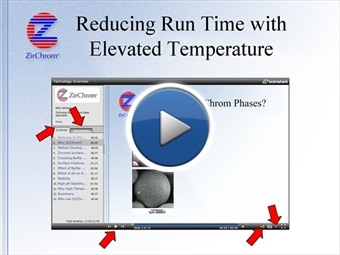 Contact ZirChrom technical support at 1-866-STABLE-1 for more details, or feel free to contact us online.